AST autumn an interesting collection of Early Italian Paintings was lent by Mrs. L. F. Holden, of Ohio, to the Metropolitan Museum of Art. After be ing shown for some time as a special ex hibit the collection has been distributed, the several paintings being placed accord ing to their schools and epochs in the various galleries. “Most of the pictures are of the Italian Schools and were bought from James Jackson Jarves who, during many years spent in Italy, gathered a number of works of art which hie hoped might be utilized as a nucleus for an American Museum for the study of Italian Art. He collected his pictures with this end in view. Though the names with which he labeled them were those of the great est, he made no pretense that the works themselves were masterpieces. “As one considers Mr. Jarves’ achieve ment as evidenced by these pictures and the paintings of that part of his collec tion acquired by Yale College, even though they were secured ‘when circum stances for their acquisition were more favorable than at present’ and though a large majority of his attributions have been unable to stand the test to which the more specialized knowledge of to day has subjected them, these words seem unduly modest. In his day, ap preciation for such works was rare, par ticularly in America. Mr. Thomas J. Bryan, who gave his admirable collec tion to the New York Historical So ciety in 1867, was the only other Amer ican at the time whose interest in primi tive paintings went so far as to induce him to purchase them, even though the price was far from high. “Mr. Jarves’ idea that a Museum be formed which would acquire his collec tion as a basis, unfortunately miscar ried. On his return to America he ex hibited his pictures in 1860 at the Derby Gallery, (325 Broadway, New York, and again in 1863 at the New York Historical Society rooms, hoping to interest influential people in his plan, but the time was unfavorable, the in terest and energies of the public being engaged far otherwise. In 1863 he vainly offered one hundred and. thirty two of his pictures to the New York Historical Society for $50,000. He found no one to second his design, and even after the Civil War his success. was no better. He was forced to deposit the greater number of his pictures with the trustees of Yale College as a pledge for a loan which the College made him. 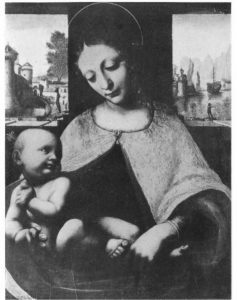 Being unable to meet his obligations, the pictures became the property of the College.” Among the pictures offered to the Historical Society in 1863 the only one which can be definitely connected with those now owned by Mrs. Holden was the “Madonna and Child” attributed to Leonardo. The Boston Exhibition in 1883-1884 was made up of works which for some reason were not deposited at Yale and others which it may be pre sumed were acquired later. This was the collection bought by Mr. Holden in 1884. Of the “Madonna and Child” ascribed to Leonardo da Vinci which is repro duced herewith, Mr. Burroughs says, “Mr. Jarves in his catalogue prints five pages of letters and endorsements from critics and artists of the middle of the last century, all unhesitatingly in favor of this attribution. Those quoted are Cav. Prof. Miglirini, Director of the Uffizi; Baron Gariod, of the Turin Museum; Monsieur Rio, the writer on art and author of a ‘Life of Leonardo’; W. M. Rossetti, Holman Hunt and Baron Liphart. “None of the specialists of to-day consider this beautiful little picture to be by the hand of Leonardo. It is ascribed pretty generally to Ambrogio da Predis; Mrs. Berenson finds that it has some analogy with that artist’s copy of ‘The Virgin of the Rocks’ in the Na tional Gallery. I will venture to suggest another name-that of Francesco Napolitano as the probable author, basing my surmise, however, only on reproductions of his work and descriptions of his color. The ‘Madonna and Child’ in the New York Historical So ciety, a vastly inferior work, is the only picture ascribed to him which I have seen recently. Relying on photographs, however, I find a striking similarity of style and form between his acknowl edged pictures and this. In the ‘Mtadonna and Child’ recently purchased by the Zurich Museum, out of a private collection in Geneva, the landscape is practically the counterpart of the view through the opening at the right in Mrs. Holden’s picture. The Zurich painting is signed with a punning sig nature accepted as undoubtedly Napo litano’s. 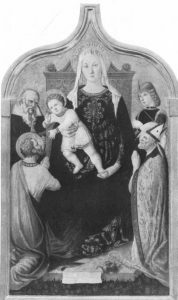 It has the same similarity to Ambrogio da Predis as has the picture in question.” To the “AMadonna and Child En throned,” with Saints Paul and Anthony at the left, Augustine and Sebastian at the right, gold background, by Lorenzo da San Severino, which is also illus trated, he refers as follows: “In this case the critics are remarkably unani mous, not only as regards the authorship of the picture, but its quality as well, and indeed no one could fail to feel the charm of its sweet sober color, the tran quillity of its expression, and the dig nity of loveliness of its personages. One of these is particularly alluring-the exquisite young gentleman with a green sprig in the pink cap saucily set on his golden curls, who poses as St. Sebastian.